Have you ever heard of Guion “Guy” Bluford—the first African American in space? Despite his major place in history, his name is surprisingly not very well-known. A new short film aims to change that, with the blessing of Bluford himself, who shared his own unpublished memoirs with the filmmakers. Here’s a look at the Indiegogo video for Guion (check out the campaign here), followed by an interview with director and co-writer Sagi Kahane-Rapport. 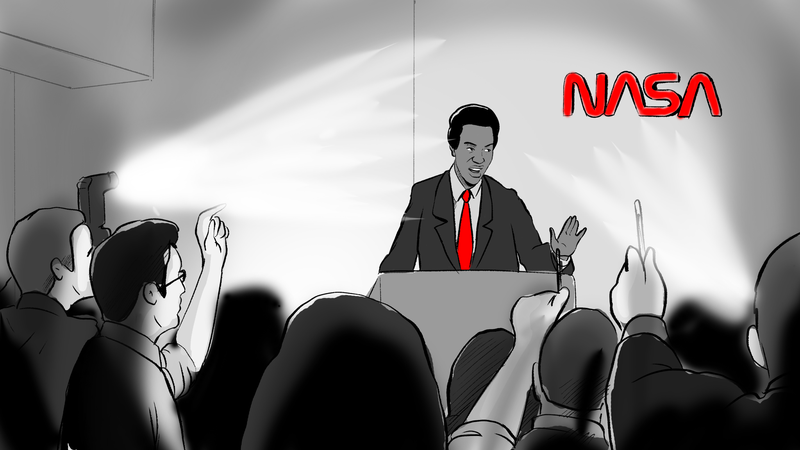 io9: Why did you decide to make a film about Guion Bluford? What personally drew you to the story? Sagi Kahane-Rapport: My co-writer [Adam Madrzyk, also the film’s Director of Photography] and I are both visual thinkers, and we’ve always been drawn to space films and science fiction. We initially learned about Guion through researching NASA missions and notable astronauts, and stumbled on his story. To our surprise, there was almost no information available about Guy. We tried to find articles and interviews, and they were pretty sparse—the most we could find were two grade school books. After doing all the research we could, we reached out to Guion and asked him if we could tell his story. We explained our perspective and why we wanted to make the film, and he agreed, and sent us his unpublished, 91-page memoir. After thoroughly poring over it, we began a series of interviews to better understand his story. Personally, I am drawn to his story because it is an inspiring story of a humble man who achieved greatness. Even just through our interviews I’ve learned so much from Guy and his worldview. He’s a man of “grit,” as he describes himself, and you can hear it in the way he speaks about his life. He’s never let any obstacles bother him or get in his way—he just puts his head down and works until he gets to where he wants, and doesn’t think too much of it. Guion’s story is about a person struggling to live their own, private life, while constantly being in the spotlight. We know that people expect us to act one way, and the pressure to live up to those expectations is staggering. Although this story is set 35 years ago, that’s still a struggle we deal with today, with the explosion of social media and the constant, filtered viewpoints we share with the world. This is a story about accepting responsibility, about humility, about being bigger than you are. And it’s a universal story about self-sacrifice, and learning to put others in front of yourself. What’s your filmmaking background? What films or filmmakers did you look to for inspiration while bringing this project together? I am a fourth year Film Studies student at Ryerson University, in Toronto, Canada. I’ve been active in the film industry for quite some time, working as a director, editor, and animator. My work ranges from commercials to music videos, and I’ve collaborated with almost the entire crew on this film in one way or another. I’m just wrapping up production on a feature length documentary, and I’m working on a number of commercials and music videos. I’ve always been drawn to true life stories, and telling them in a memorable and digestible format. I’m constantly inspired by seeing other people’s art—whether that is short-form narrative content on Vimeo, art installations, or longer form feature films, I try to take one lesson from everything I see. An obvious example of an inspirational film for us is the film Hidden Figures—a great period piece telling a narrative we don’t often see. I think that film did a great job of representing the time period and the people in it, although I was disappointed with how fictionalized some things became. Visually, I’m inspired by directors like David Fincher, whose motivated use of camera movement really helps you get in the mind of the characters. Tonally, we will be channeling films like the short film Anomaly, crafting a moody look with dark undertones. We want our camera to have a fluid, floating feel, as we drift through time and space, backwards through Guion’s memories. I love the Coen Brothers’ work as well, for the way they let conversations play out, and how they empower characters to say a lot without speaking at all. I’m also inspired by the classics like Spielberg or Kubrick, because of how elementally true the language of film they use is. I try to ask myself as many questions as I can about the decisions I am making as a director, to make sure everything an audience sees on screen has a distinct purpose. What format will the film take — documentary, narrative with documentary elements/re-enactments, straight-up narrative, etc? Why did you decide on that format for this story? Although it is non-linear, occurring in the 60s and 80s, the film’s structure will be entirely narrative—following Guion in 1983 when he learns he is to be the first African American man in space, and flashing back to 1960, when Guion is in his senior year of high school. We’ll follow Guion as he realizes the magnitude of what he is about to do, and how he appears in other people’s eyes. It’s a highly character-driven piece—because we don’t have the budget for a full-length feature film, we decided to focus the film on Guion as a character, rather than try to shoehorn his entire life story into 15 minutes. This format felt right because we wanted to tell a story that can connect with viewers on an emotional level. Guion’s struggle is personal and relatable, and we felt that depicting that through narrative elements would help create a lasting memory of his story with viewers. Unfortunately, Guion’s story is relatively unknown, and I believe the value it can bring to audiences is best served through a relatable, memorable narrative. We’ll be shooting digitally on an Alexa Mini, which is one of the top-tier cameras currently available. To help sell our retro look, we will be using vintage anamorphic Kowa lenses, and working carefully with a colorist to color grade the film correctly. Visually, we will be creating a period piece drama that relies heavily on nuanced performance. We’re doing a lot of research to reference materials and historical imagery to make sure our props, wardrobe, and set are accurate. What’s Guion Buford like as a person, and how does he reflect on his place in history? Guion is an absolutely fascinating person to talk to. His perspective on going to space offered us an inside view into the mechanics of the way NASA worked (and works), and just imagining his journey constantly inspired us. What’s perhaps most interesting is how he reflects on his place in history—although he recognizes his historic role, he doesn’t consider himself an all too important or significant person. He is a fundamentally even-keeled, logical, undramatic man, who prefers to live life without any “hoopla.” In fact, he told us that he doesn’t even mention he is an astronaut to people he meets nowadays, preferring to simply be recognized on his own merits and personality. This perspective is a central theme in our film—the challenge to retain one’s identity when being placed in the spotlight. What was the most surprising thing you discovered about him and his story? What surprised me most about Guion was the way he views himself, and his story. When we interviewed him, one of our first questions was quite obvious: How did your race affect your career at NASA, or your path to it? Were you held back at all? To our surprise, he explained that he did not struggle because of his race. In his view, he was neither hampered nor helped by his race at all—it wasn’t even a consideration. His race simply didn’t factor into it. He doesn’t deny the racial injustices that occurred (and are still occurring) in American culture and beyond. But for him, it simply wasn’t a struggle he felt he had to contend with. In fact, he even presented the obvious struggle to become an astronaut as barely any struggle at all. Guion plays down all of his achievements, and his struggles too—today, he doesn’t even tell people he meets that he is an astronaut. He legitimately believes his life was just normal, that he is just another aerospace engineer who happened to go to space, and that he never encountered any major obstacles. And he isn’t hiding anything from us. He was open with us, and wants us to make this film. But we asked ourselves: How could this man, who achieved so much, be so reluctant to realize his greatness? How could he look back at his life and deem it so devoid of conflict, of drama? The truth is that Guion is an intensely private man—as I mentioned, he likes living life without “hoopla.” And that’s how our story began to form: When when we realized that Guion’s greatest struggle was coming to terms with his new reality of being a cultural icon—the reality of now being in the spotlight. So it’s not the story you might expect when you hear the logline. But I think that’s not a bad thing, because as Guion himself might say—things aren’t always black and white. When are you hoping to start/finish the film, and where do you hope to take it (festivals, theatrical release, Netflix, etc)? Also, why did you turn to crowdfunding to finance the project? We’ve been in pre-production for the last few months, and we’re looking to shoot in February. We’d love for it to land at our largest hometown festival, TIFF (the Toronto International Film Festival). Beyond that, we’d love for it to play in as many festivals as we can get it, and eventually release it online. Turning to crowdfunding was an easy decision, because as young filmmakers, finances are never easy. Our cast and crew is entirely volunteer and we’ve been supported by some great film production companies in Toronto. But there are still very real costs to this film, that we simply can’t afford. Our crew, which on some days will be up to 30 people, needs to be fed. Our sets, props, and wardrobe need to historically accurate and convincing, and that’s expensive. Renting the right equipment and securing our locations is expensive too, and this is not a film we want to cheap out on. It’s an untold story that deserves to be told right, and we need all the help we can get to make that happen. The key creatives on this film will be contributing financially, but we can’t do it alone. The film will cost us at least $15,000 CAD (about $12,000 in real money to you US folk), and we’re looking to raise $10,000 with an Indiegogo campaign. We’ll be offering some great perks and behind the scenes looks at the film, as well as the opportunity to help tell a truly historic story. Check out the Indiegogo campaign for Guion right here, and follow the film’s progress on its Instagram page, as well as director Sagi Kahane-Rapport’s Instagram page.